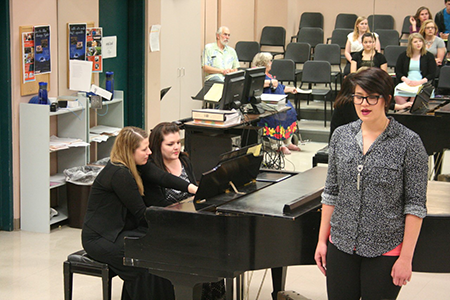 The Cowley College Choral and Vocal Department conducted spring vocal recitals on Thursday. The applied voice studio recital featured Vocal Music students who have been studying voice privately during the spring semester. Each recital featured students enrolled in Applied Voice and Applied Lesson Seminar. Students that took part in the recitals were: Emily Lawson, Kyle Smith, Lizzie Willie, Molly McCune, Ashley Daniels, Joey White, Jon Claybaugh, Riley Paye, Clay White, Charity Schmidt, Mary Wellman, Austin Crowe, Caleb Bettles, Austin Sherman, Paige Lundin, Mairi Baker, Haley Golightley, Josh Waldorf, Allie Lawrence, Jonathan Lane, Julianna Soto, Steven Lu, Semaj Smith, Hannah Coryea, Whitney Ossola, Zachary Heyer, Yvette Rosales, Kendra Doeskin, Jessica Burke, Monica Morris, Mitchell Hoover, and Michael Rodriguez.